There was a time when we are not talking to each other because of one argument. But the day after was the schedule of our allotment. He called me and told me he already sent the money on my bank account. But since I am still mad with him yesterday, I just utter "okay" then say goodbye. That gesture hit him. Then he started ranting over facebook messenger and made me realize how immature and awful my treatment was. That's when I learn that my spouse needs a simple way of affirming his effort. The fact that it is solely his duty and responsibility to work for us is way too hard to just hear the unbearable tone from me. So after his rant, I say sorry and tell him that it won't happen again. That I am lucky enough to have him as my husband and for his support financially as a good provider and emotionally as my shock absorber during my stressful days as a mom. I am glad that he addressed me my attitude towards that incident. The next months, I made sure that whenever he sends me our budget, I let him know that I am beyond thankful for that. What do I got in return? A super warm welcome from my loving husband. Sometimes, what we need as couples are open conversations, words of affirmations and gestures of love. They don't have to be grand, but a simple genuine kind words is enough to let the love keep burning in each other's heart. How did you know? Did you take the online test? simple, genuine words of affirmation, kindness and appreciation always work in any kind of human relationships I believe... it is important that we know these so we dont fail to communicate our love to our partner. i need to share this post! Thank you Sarah! 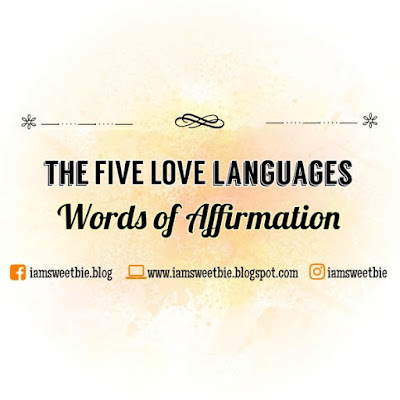 Have you tried the online test to know what is your love language?